You are permitted to represent yourself in a Texas uncontested divorce that does not involved children. This article discusses the forms assembled by Texas Law Help to be filed in such cases. For these forms to be used, a spouse will need to either file a waiver giving up their right to respond to your petition or to agree to the terms of your divorce decree. 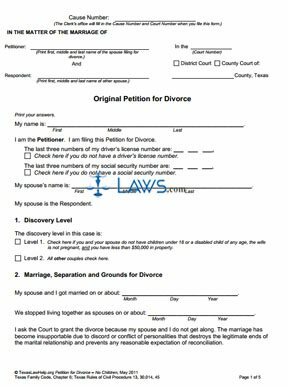 Texas Uncontested Divorce Process Without Children Packet Step 1: The first form in this package is a six-page petition for divorce. Provide your name as the petitioner and provide all information requested about both spouses, your Texas residency status, the date on which your marriage was performed and the date on which you ceased living together, note any children who are not involved in the divorce, detail your property and specify whether you wish to have your premarital name restored. Sign and date the form. Texas Uncontested Divorce Process Without Children Packet Step 2: The second form is a waiver which can be filed by your spouse once they are served with a copy of the complaint filed against them. This document attests that they are willing to let the judge rule without their involvement. Texas Uncontested Divorce Process Without Children Packet Step 3: Alternately, the respondent can file the third form, which is an Answer document. This document states that you disagree with some part of the petition for divorce and wish to be notified of all future hearings related to the divorce. Texas Uncontested Divorce Process Without Children Packet Step 4: The last document is an eight-page divorce decree that can be submitted detailing the terms of the separation. If the responding spouse waives their right to dispute and comes to agreement on property division and related issues, this document can be jointly submitted to a judge for approval. The divorce will then be finalized.